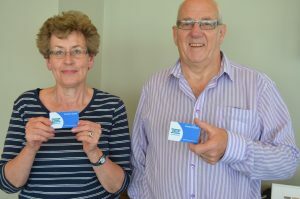 Carers Marianne Hoban and Henry Freemantle look forward to using their Carers Card across Dorset. 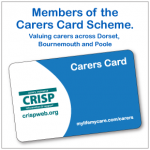 The Carers Card Scheme has launched this week and carers across Dorset are receiving their cards in the post. Henry likes to keep fit so he will be using his card for a discount at a local leisure centre. Marianne would like Harry Ramsden’s to join the scheme so we will be contacting them. Both Marianne and Henry joined other carers at a social event yesterday at The Haven Hotel, many of the other carers at the event were excited to receive their card and offered to contact their local businesses to grow the scheme and hopefully enjoy discounts with their local retailers. Keep an eye open in your local high street for the window sticker to appear advertising that businesses are a part of the scheme and will accept your Carers Card and keep checking back regularly on the Directory page https://www.mycarerscard.co.uk/directory/ for new businesses that have been added. Thanks to Marianne and Henry for their permission to publish the photograph. Carers Card 1 Year Old – 182 Discounts available!